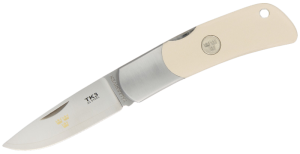 The TK3im is a nominal Tre Kronor Series 3 knife with a handle made from Ivory Micarta which is probably one of the strongest materials available around as far as knife handles go. This handle also offers a particular texture as well as a special feel to the pocket knife. With a steel blade that is 2.76 inches long and which is made from Fallkniven’s quite revolutionary 3G steel, you really cannot go wrong with the TK3im. 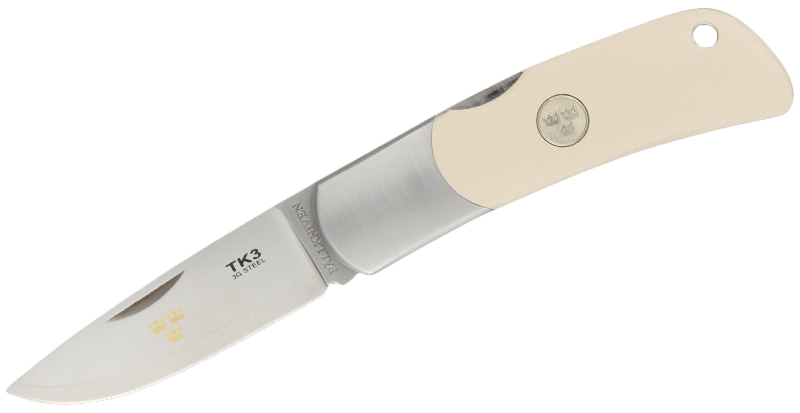 The TK3Im is an elegant and modern looking lightweight folding knife which also ensures safety and reliability. With the new 3G edge steel which is an anticorrosive steel comprised of one layer of Super Gold Poweder Steel and VG2 sides you really cannot go wrong when using this sort of knife in all sorts of situations. It has a beautiful and quite enduring design which is the result of an extremely long refinement process which has created the ultimate folding pocket knife. It is interesting to note that the TK3im blade locks in an open position due to a well proven locking mechanism which makes it sturdy and extremely comfortable to use. The Tre Kronor series models are all manufactured by hand and this means that there are small variations in the way they appear since no single knife is the same. The handle which is made of Ivory Micarta is beautiful to look at but is also very practical in the sense that it is quite strong and very sturdy providing an excellent grip. With a size that is perfectly adept for everyday use, the TK3im also comes with a Black cordura pouch that is a work of art in its own right and adds substantial value to an already classic knife.